"...our kids must be able to do these things without resorting to calling a parent on the phone. If they're calling us to ask how, they do not have the skill." If we want our kids to have a shot at making it in the world as 18-year-olds, without the umbilical cord of the cell phone being their go-to solution in all manner of things, they're going to need a set of basic life skills. 1.) An 18-year-old must be able to talk to strangers — faculty, deans, advisers, landlords, store clerks, human resource managers, coworkers, bank tellers, health care providers, bus drivers, mechanics—in the real world. 2.) An 18-year-old must be able to find his way around a campus, the town in which her summer internship is located, or the city where he is working or studying abroad. 3.) An eighteen-year-old must be able to manage his assignments, workload, and deadlines. The crutch: We remind kids when their homework is due and when to do it— sometimes helping them do it, sometimes doing it for them; thus, kids don't know how to prioritize tasks, manage workload, or meet deadlines, without regular reminders. 4.) An 18-year-old must be able to contribute to the running of a household. 5.) An 18-year-old must be able to handle interpersonal problems. 6.) An 18-year-old must be able to cope with ups and downs of courses and workloads, college-level work, competition, tough teachers, bosses, and others. 7.) An 18-year-old must be able to earn and manage money. 8.) An 18-year-old must be able to take risks. Julie Lythcott-Haims is the former Dean of Freshmen at Stanford University and the author of "How to Raise an Adult." 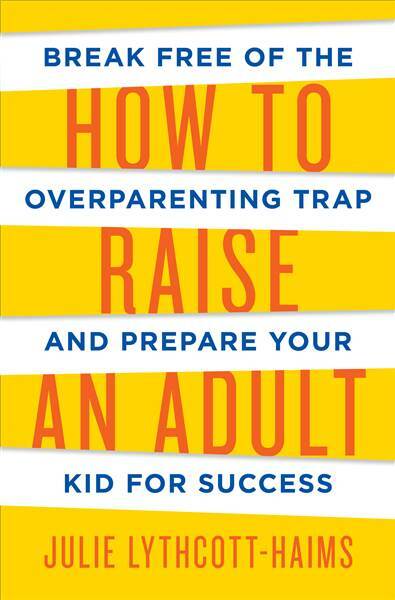 In her new book, Lythcott-Haims has delivered a provocative manifesto that exposes the detrimental effects of helicopter parenting and puts forth an alternative philosophy for raising self-sufficient young adults. She draws on research, conversations with educators and employers, and her own insights as a mother and student dean to highlight the ways in which over-parenting harms children and their stressed-out parents. While empathizing with parents' universal worries, she offers practical alternative strategies that underline the importance of allowing children to make their own mistakes and develop the resilience, resourcefulness, and inner determination necessary for success. Relevant to parents of toddlers as well as of twentysomethings, come hear a rallying cry for those who wish to ensure that the next generation can take charge of their own lives with competence and confidence.